Tom Best is an acknowledged expert on ponies. Co-founder of Waxwing Stud, he has bred and produced riding ponies as well as Welsh ponies at the highest level, qualifying them for the Horse of the Year Show and taking championships at shows such as the Royal, Great Yorkshire, Royal Highland, Royal Welsh, National Pony Society and Ponies UK. 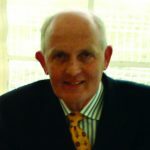 In a parallel career as a panel judge, he has judged overseas and at all the major British events including the ‘London’ Shows (which include the Royal International Horse Show and Royal Windsor as well as the Horse of the Year Show), where he has judged the show pony, show hunter pony and working hunter pony finals. He is a graduate of Edinburgh University where he studied agriculture before becoming a secondary school teacher and gaining more than 30 years experience in education. His interest in ponies stems from his father who loved horses and worked with them in his youth. From the age of nine when he was given his first pony, a growing interest soon developed into a passion and resulted in the founding of the Waxwing Stud in West Fife in 1972. He was persuaded by Joan Lee-Smith, Patron of Ponies Association UK, and the late Elspeth Ferguson of Rosevean Stud to record for posterity the history of the British Riding Pony before the evidence of its origins was lost forever.